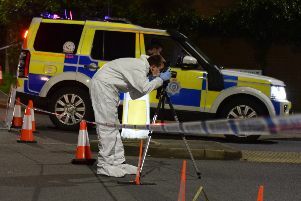 Police say two men were lucky they were not engulfed in flames after they attempted to set fire to a petrol pump at an Eastbourne service station. They have released an image of a pair they want to speak to in connection with the incident in the early hours of Thursday, August 9. Sussex Police say two men were seen to approach the pumps at the Old Town Service Station around 1am, trying to shake any fuel out of one pump before moving on to another where they released a small amount of fuel, which they set light to, causing a small, brief fire. As it ignited, they dropped the nozzle and ran from the scene. Police have warned that their actions could have been disastrous for them and people living locally. Firefighters were called to the scene but the fire was short-lived and out on arrival. Anyone who recognises the men, described as white, in their late teens or early 20s and around 5ft 10ins, or who has any information about the incident is asked to report online or call 101 quoting serial 50 of 09/08.